Auggie Pullman was born with several "small anomalies". In fact his face was so disfigured from birth and numerous surgeries, his parents elected to homeschool him that is until 5th grade. Auggie is about to face his greatest fear, being the new kid at Beecher Prep. And everyone knows middle school kids are not the kindest and most considerate. Inside Auggie is just an ordinary kid with ordinary dreams and aspirations, but he has an extraordinary face. He knows it will be a struggle to convince his classmates that he doesn't have cooties and that his disfigured face isn't contagious. But how will he do it? How can he convince his classmates that they can be brave enough to go against the popular culture of making fun of him and actually befriend him? There is only one way - to bravely show them what he is like on the inside. 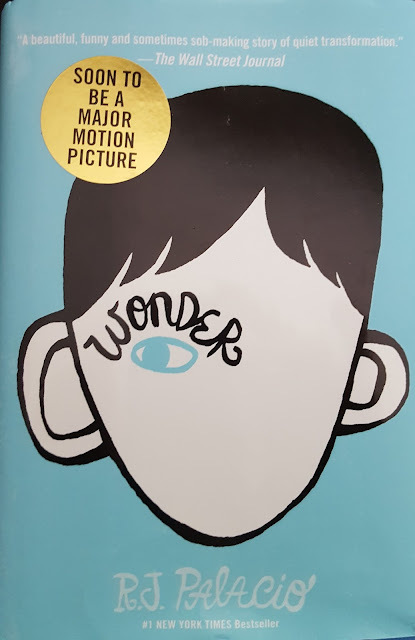 Wonder is well written, has wonderfully and accurately created characters. I highly recommend it to parents and children of all ages. There are a host of great lessons to be learned from this entertaining read.